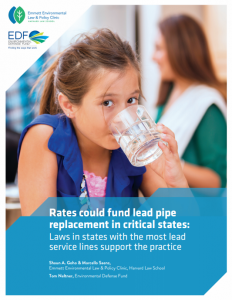 In Rates could fund lead pipe replacement in critical states, Emmett Environmental Law & Policy Clinic at Harvard Law School and Environmental Defense Fund reviewed state laws and policies in 13 states with the most lead service lines (LSLs), and found no explicit barriers to using rate funds to replace the lines on private property. These states have an estimated 4.2 million LSLs, more than two-thirds of the nation’s total. In these states, publicly-owned utilities can act pursuant to existing state legislation by determining that the practice serves a public purpose—protecting public health. Investor-owned utilities can do the same, but typically need approval of the state’s utility commission. While we have not reviewed the remaining states, we anticipate that the state laws and policies are similar to the ones we evaluated.